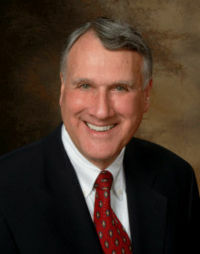 Jon Kyl, born April 25, 1942 (age 76), is a United States Senator from Arizona, serving from 1997 to 2013 and again from 2018. At the time of his first retirement from the Senate in 2013, Kyl served as Senate Minority Republican Whip. In 2008, National Journal ranked Kyl the most conservative U.S. Senator. He previously served as a U.S. Representative. Arizona Governor Doug Ducy appointed Kyl to replace Senator John McCain after the latter died. He was sworn in on September 5, 2018. Kyl co-sponsored legislation that would give illegal immigrants up to five years to leave the country. In February 2006, Kyl joined Senator Lindsey Graham in filing an amicus brief in the Hamdan v. Rumsfeld case, which appears to have been an attempt to mislead the Supreme Court by presenting an “extensive colloquy” added to the Congressional record but not actually spoken live in the December 21, 2005 debate as evidence that "Congress was aware" that the Detainee Treatment Act would strip the Supreme Court of jurisdiction to hear "pending cases, including this case" brought by the Guantanamo detainees. Kyl appeared in the U.S. national news near the end of his 2006 campaign as an example of a case where some bloggers were attempting to influence search engine results for searches on Kyl's name. ↑ Fedschun, Travis (September 4, 2018). Jon Kyl named to succeed John McCain in the Senate. Fox News. Retrieved September 5, 2018. ↑ Kyl sworn in to fill McCain's seat. Fox News (from the Associated Press). September 5, 2018. Retrieved September 5, 2018. Kirkwood, R. Cort (September 5, 2018). Former Senator Jon Kyl Replacing McCain: What Will He Do? The New American. Retrieved September 5, 2018. Farber, Madeline (September 4, 2018). Jon Kyl to replace John McCain: 3 things to know about the former Arizona senator. Fox News. Retrieved September 5, 2018. This page was last modified on 9 April 2019, at 11:02.